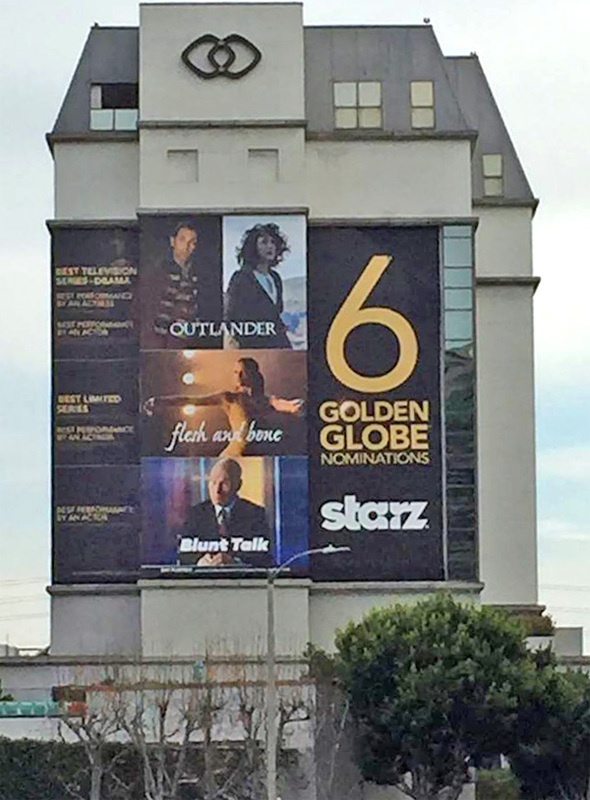 The Outlander TV series is nominated for three Golden Globes for its first season! MASSIVE congratulations to everyone—cast, crew, and fans <g>who’ve made the show the wonderful thing that it is! Wish us Luck! There’s Stuff going on every day: the TCA (Television Critics Assn.) 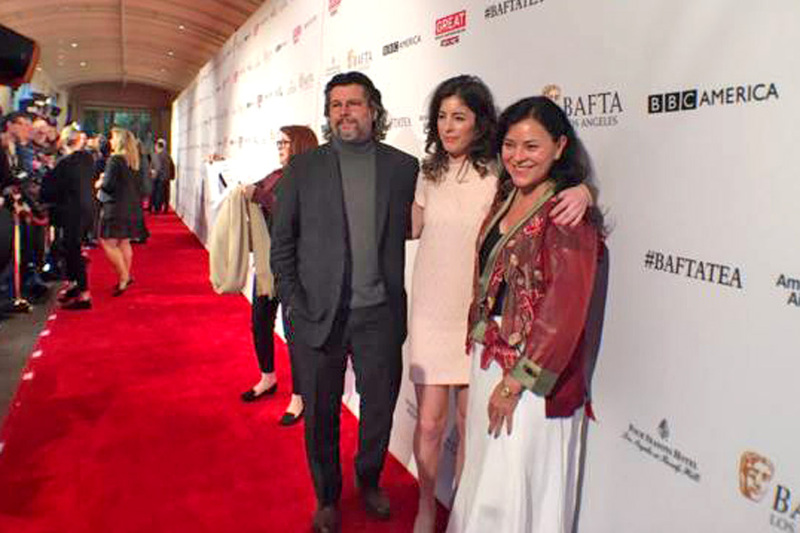 (and a zillion follow-up interviews) on Friday, the STARZ pre-Golden Globes party Friday night, the BAFTA Tea on Saturday (that’s me above with Maril and Ron, on the red carpet). And the awards ceremony will be broadcast live TODAY at 5 p.m. (Pacific Time), with red carpet coverage beginning at 4 p.m. (More information below). "Best Television Series – Drama" Update: The winner of this category is "Mr. Robot." 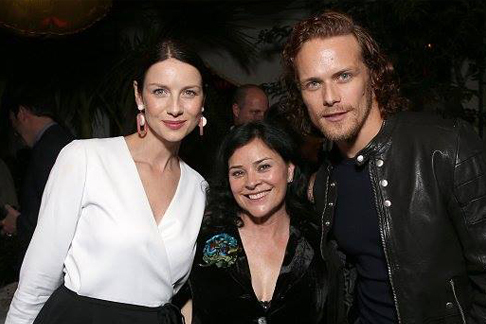 Catriona Balfe (above, with Sam Heughan and I) is nominated for "Best Performance By An Actress In A Television Series – Drama,” for her portrayal of Claire Beauchamp Randall Fraser. Update: The winner is Taraji P. Henson, from Empire. 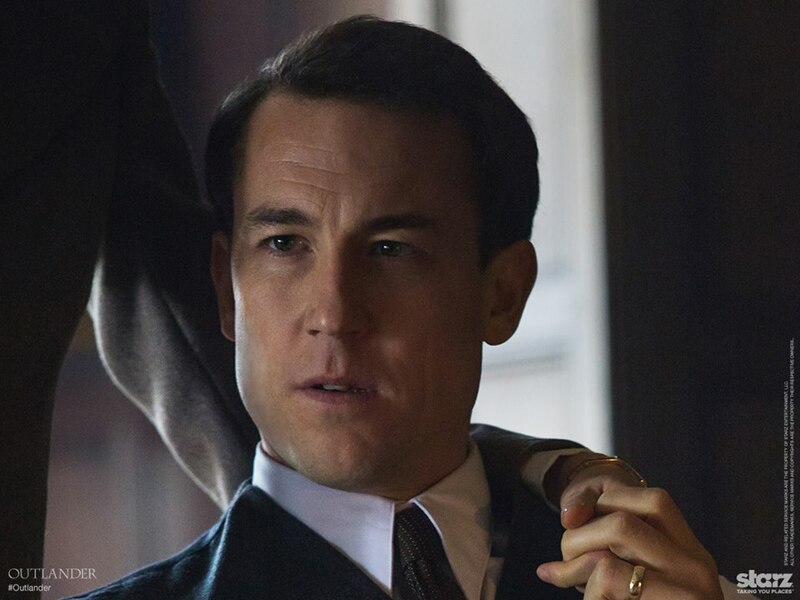 Tobias Menzies (at right) is nominated for "Best Performance By An Actor In A Supporting Role In A Series, Limited Series, or Motion Picture Made for Television" for his portrayal of Black Jack Randall and Frank Randall. Update: The winner of this category is Christian Slater. 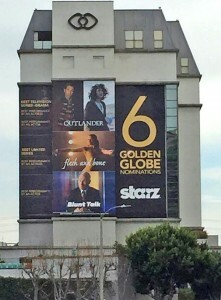 The Starz network received six Golden Globe nominations in total, with Outlander garnering half of them. 4 p.m. (PT): NBC’s red carpet pre-show begins. Coverage of stars, producers, and authors in their glamourous gear walking by on the Red Carpet! On the east coast, this live program begins at 7 p.m. (ET). 5 p.m. (PT): 2016 Golden Globe Awards – the main awards begins, a three-hour show. It will be broadcast live from the Beverly Hilton Hotel in Beverly Hills. On the east coast, the live show will begin at 8 p.m. (ET). Check your local schedule to confirm. In the U.S.A., you have paid cable or satellite TV, look for NBC in your channels guide. Or, if you use an HD antenna to access free TV broadcasts, look for the broadcast NBC affiliate in your area. If you live in Chicago, Dallas, Los Angeles, Miami, New York, Philadelphia, or San Francisco and subscribe to Playstation Vue, you may be able to legally stream NBC online. Other than that, NBC is not streaming the show. Some cable networks are streaming shows covering just the red carpet before the show, though. Where to Watch – Outside the U.S.A. Some cable subscribers outside the U.S. will be able to see the show. Foxtel in Australia will show the event. In Canada, CTV will broadcast it. However, watching the show won’t be available in the United Kingdom, even though the event host, Ricky Gervais, is from there. To be sure, wherever you live, CHECK with your local provider to see if and when the awards show will be shown in your area. LOVE this series, it’s been so long since I read the first few books, is this TV series all taken from the first book or is the next season book two. I know I should read them all again!!! Best wishes all around. Fingers crossed. Will be watching tonight. 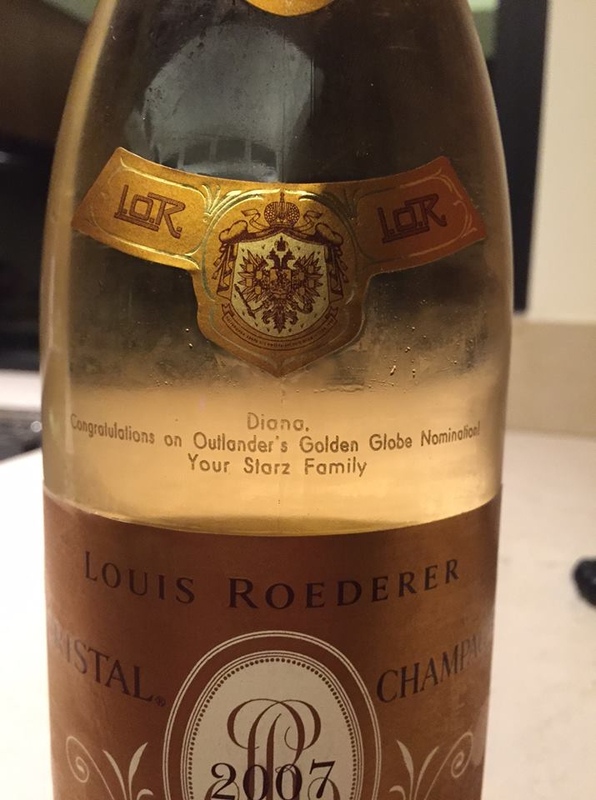 Congratulations to you Diana and the entire team of “Outlanders” at Starz!! May you enjoy great health, happiness and prosperity for very many birthdays to come! writing. There’s a reason behind the name, but that’s a long story.). Was visiting Santa Fe this weekend and thought of you often today especially – what fun it must be to be whisked away to LA for these things. A dream coming to fruition. Happy for your fairy tale experiences, and grateful for the ways you have helped the rest of us be whisked away on adventures through your imagination. What a great gift you’ve given. Diana just wanted to say how much I LOVE what you’re wearing to all these functions. I love your look and hope you’re all having a blast. Happy Birthday. Hard luck last night. I stayed up to watch, which I never do. The Outlander nominations felt very personal to me. I was really cheering for Outlander, Caitriona and Tobias. 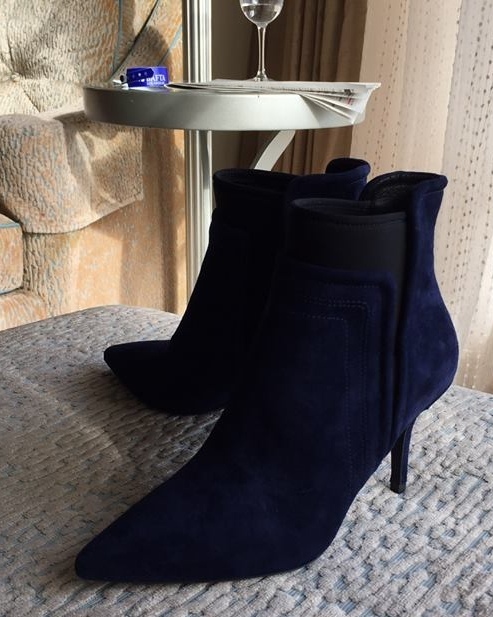 You looked stunning and loved the blue suede booties. Thanks to you and all the other kind Outlander supporters! It would have been nice to win an award, but really, for a brand-new show that’s had only _one_ season out, and a premium-cable show at that, to get _three_ Golden Globes nominations first crack out of the box is amazing. (And in all honesty–having been nominated for a few literary prizes, and having won a couple…the only point to such awards is that they increase the visibility of what it is you do–your book, your show, etc. And _that’s_ what’s important; that you want people to know about and experience this Thing you do [g]. And in terms of visibility, being nominated really is just about as good as winning. Not that I don’t hope we’ll win _next_ time, mind you…[g] But we’re all happy now! Happy Birthday to my favorite author! Thank you so much for your beautiful stories Diana. Her parents’ love story still brings tears to my eyes every time I read it! Happy Great Birthday! Enjoy your adventurous life always! Will we ever find out anything about the “ghost” that was standing outside Claire’s window at the beginning of Outlander? I have heard it was Jaime, but I can’t figure out how it happens? Vse najboljše za rojstni dan, Diana! Happy Birthday!!! Safe travels home from LA. Should be wonderful to sleep in your own bed. I did not learn about Outlander until 2015, since as an historian and archivist, I tended to read non-fiction. Yet in my youth I was avidly into fiction, especially historical. Outlander was suggested to me as a great serial read only early last spring. I took the first book out of my library, not knowing what to expect. All of your books including the Lord John series were read by me between May and September! What a joy to now follow the STARZ series and re-read the first book to see how the plot twists and dialogue were either modified or retained! Happy Birthday, Diana, and I happily await book 9 and Season Two of Outlander. I am just sorry that our nominees for the Golden Globes did not win, for the performances were outstanding, and the series is wonderful. Thank you for sharing via this blog, especially this inspirational story about your parents’ romance. My hubby and I were told “there’s no future in it” when we began dating, yet have been together 45 years! I am sure that you write the way you do because your life has been full of romance and love that knows no boundaries. Thank you, Cynthia! And congratulations on following your own heart! What a wonderfully fulfilling birthday this must have been, Diana. And what fun to be at all the galas with such fine people as Cait, Sam, Tobias, Ron, and Maril. And then to have blue suede shoes that were seriously gorgeous! Hope it was a birthday full of delights. I hope you had a wonderful day for your birthday! Congratulations on the Golden Globe nominations! I watched the entire show only because of the Outlander nominations. It is great to see you all recognized for your work! I hope Sam an Cait remain good friends despite whatever compelled them to make their announcement. I never thought they were together but have enjoyed their friendly banter. Looking forward to Spring! I have loved reading your books,numbers of times.They are so wonderful and thrilling.Your imagination is superior.I look forward to your next book and the second season on starz!Thank you for letting us escape to this wonderful fantasy and a touch of history.It makes me want to visit Scottland,and witness for myself the men in their kilts.